PCR can be used to measure the quantity of DNA or RNA in a clinical sample. The quantitative PCR (Q-PCR) is very useful in diagnosis and monitoring response to treatment in infectious or malignant diseases. Q-PCR is mostly done by real time monitoring of amplification requiring expensive equipment. GTI-PCR Reader-G provides a cheap solution to Q-PCR by measuring the end point fluorescence after doing PCR in an ordinary thermal cycler by fluorescent labeled probes. 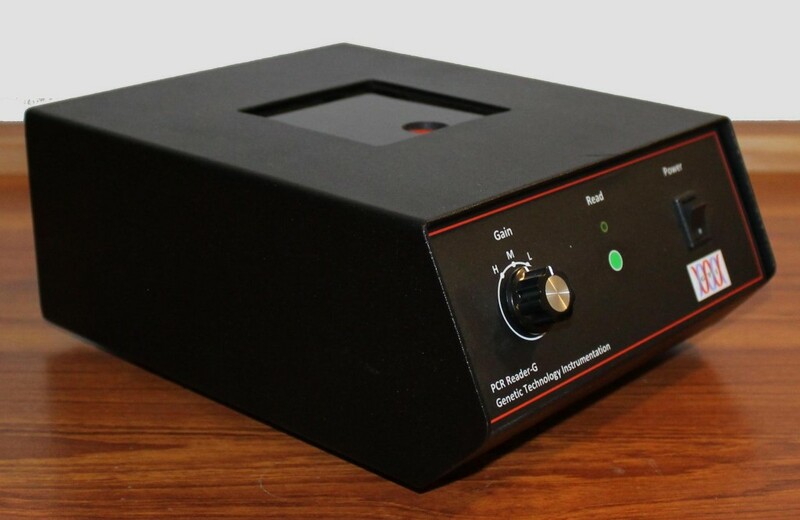 GTI PCR Reader-G is designed to read the green endpoint fluorescence (512 nm) in a PCR reaction vial with volume as low as 12ul. The fluorescence is measured through data acquisition software installed on a computer. Known positives and negatives can be used to obtain accurate quantitative PCR results. Wide range of applications in PCR of infectious diseases and malignancies for example HCV, HBV, Dengue, TB, Malaria, Leukemia, Lymphomas etc. Copyright 2015 GTI-PCR Reader-GGenetics Resource Centre .